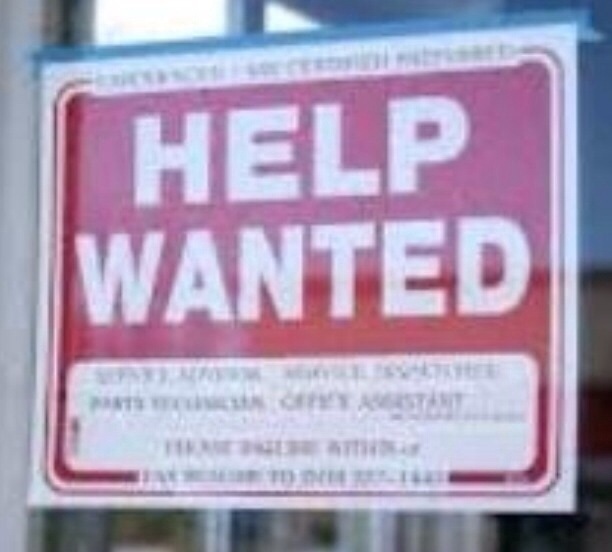 Have you ever noticed job adverts in local shops? I do occasionally, it was how I got my first job delivering morning newspapers. Shop window adverts are a bit like ‘word of mouth’ and ‘friend of a friend’ recommendations, they can appear a bit outdated in the modern digital world. They are however very much part of the reality of everyday life, particularly outside of the mainstream corporate world of the private and public sector. They can be informal, unstructured and sometimes a bit quirky, which I think is fine. The local high street needs to offer something different from the out-of-town generic ‘Anytown’ shopping experience (staff included). One question though, how do you increase the chances of the ‘right person getting the right job’, particularly if all you rely on is a chance encounter with a handwritten advert in the street? Well, here is a fantastic example of someone improving the ‘right person, right job’ chances, with some imaginative use of Twitter. @shopwindowjobs. Handwritten job adverts, Twitter and Tom. This is an astonishingly straightforward tale. “Promoting jobs directly from shopwindows and jobfairs across North Wales and beyond”. Let Twitter share these images of job adverts far and wide, so that the right person can find the right job. 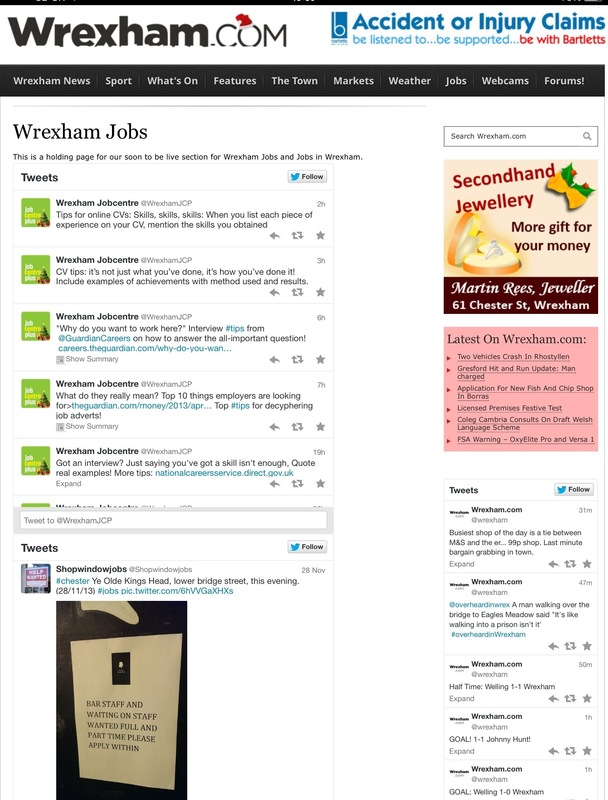 The clever people at the local online news site, wrexham.com pick up Tom’s @shopwindowjobs Twitter stream and put it on their jobs section. Now, wrexham.com gets well over half a million views every month, mostly from people in the Wrexham and North Wales area. Not all of them will be visits to the jobs page, but there is a much higher chance that those photographs taken by Tom will be seen by the right person for the job. Result! A very low-cost method of spreading information across a huge number of people. From handwritten adverts, to digital photographs, to Twitter and probably a bit of conversation at the end when a friend or relative tells someone else, “Tidy la’, have you seen this job” (in a Wrexham accent). Imagine if there was a network of people voluntarily posting shop window jobs on twitter for towns, villages and cities across the UK? That’s got to be a helpful way of getting people into employment, helping business, allowing people to do their bit to support the local community, and best of all, it costs virtually nothing. Well done to Tom, I really hope @shopwindowjobs gets people into jobs they enjoy. I also hope he gets some recognition for his imagination and enterprise. Finally. I suspect my friends from the Communications Professionals world would call this ‘multi channel communication’ (doing lots of different things for the rest of us). There are lessons to be learnt that extend beyond this jobs and recruitment example. If you have a specific piece of information, how best can you get this to the people who need to see it, who might be located anywhere in the local area? Could you do it using easily available digital tools and an enthusiastic individual? How might this work if for example, the information was about promoting better health or providing care? Plenty to learn from Tom I think. Many people have very interesting and useful ideas about the jobs they do. Creating an environment where these ideas can be developed and tested is necessary to encourage more ideas. 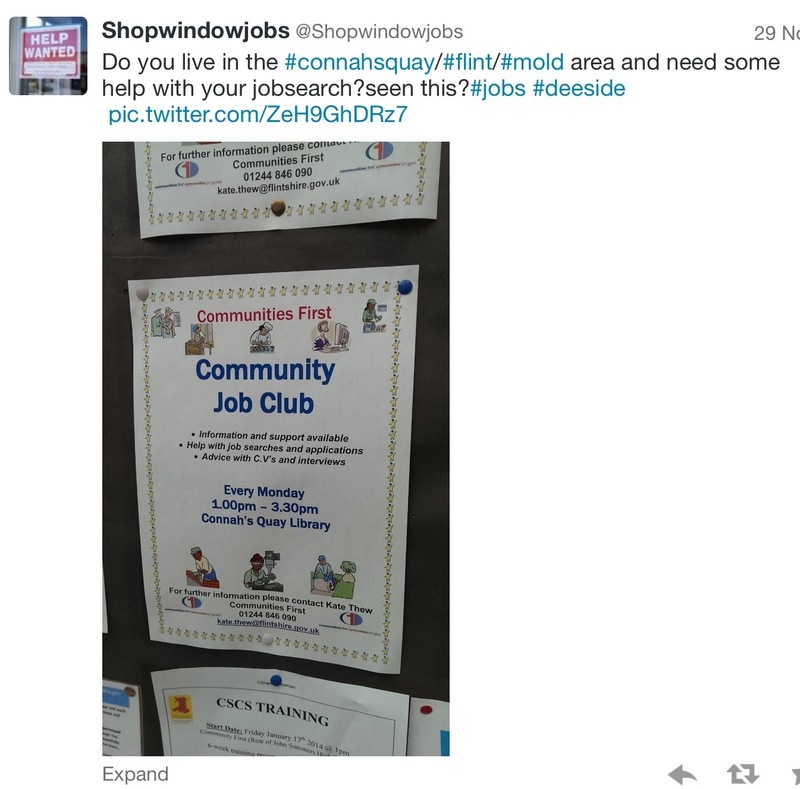 @shopwindowjobs is a great example of what can be achieved, at virtually no cost (with some help from wrexham.com). And it’s not just jobs, here is a link to a Community Job Club in Connah’s Quay. That’s an excellent idea and it could work anywhere. Thanks for sharing something positive in this festive season – it’s nice to see hope, goodwill and a true sense of community !